Luton Town have confirmed their seventh signing of the summer by bringing in former Colchester United defender Magnus Okuonghae on a two year deal. 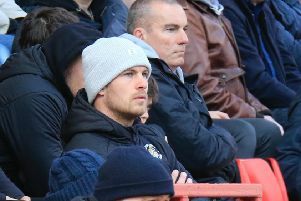 The 29-year-old spent the last six seasons with the U’s, playing 196 games in League One and scoring eight times, while also having the captain’s armband as well. Before that, Okuonghae was at Dagenham with now Luton boss John Still, who brought him to Victoria Road from then-Conference club Crawley Town. The Nigerian-born defender was snapped up by Colchester when his contract ran out and although missed a large part of last season with an Achilles injury, only missed seven league games in the three seasons beforehand.